In a flash, Yan Shangyang appeared beside Su Yi, putting himself in danger. But he knew clearly that he needed to get rid of Su Yi first. A thick coat of bloodlust hung around him as his palm struck out directly for Su Yi’s head. Yan Shangyang may be seriously injured, but this strike was still swift and strong. Before his palm landed, the air around the palm shrieked due to the impact while a light radiated from it. Facing Yan Shangyang’s ruthless attack, Su Yi’s face had a grave look. After just using the move “Wrath of the Eight Wastelands”, he really did not have much strength to be able to retaliate against the incoming attack. Following only his instincts, Yuan Qi gathered under Su Yi’s feet and he sprung back without a single delay. Seeing Su Yi’s rapid retreat, Yan Shangyang’s face was twisted with fury. Since their last encounter, he had already found Su Yi unpleasant. With his cultivation level of Yuan Xuan Realm Grade One and his King Grade Talent, he was currently put in such a pathetic state by a brat of only Yuan Soul Realm Grade Three. His heart was overflowing with hate and resentment. 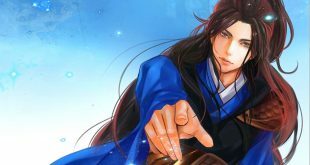 As he changed his palm into a fist, Yuan Qi surged from his fist, the power of the fist shook the air and seemed to give off a light which looked solid. This phenomenon was “Coat of Yuan Qi”. Only those who had reached the Yuan Xuan Realm could use this move and it could be considered the proof that one has reached the Yuan Xuan Realm. Feeling the fist’s power, Su Yi’s face was grim. He had used too much of his energy, dragging this confrontation on was not good for his situation. He clenched his teeth while the Yuan Qi in his body boiled. With a cold shout, Yan Shangyang found his chance. How could a Yuan Soul Realm Grade Three kid ever be a match for him? Though the kid had dodged his previous fist, at the same time, he swung his arm down and smashed it mercilessly against Su Yi’s shoulder. “Boom!” A loud, deep sound rang out as a terrifying strength hit Su Yi’s shoulder directly. But at the same time, for some reason, Su Yi’s face turned wild as his veins bulged. Su Yi hollered out loudly as his right fist appeared right before Yan Shangyang’s face. A horrifying wave of Yuan Qi erupted from Su Yi’s face like a volcano. In the midst of the bright light, Su Yi’s fist seemed to grow even bigger as howls of wind and low roars of thunder sounded out clearly. An oppressive power like the awakening of a tyrant, like the descent of an emperor, burst out. As the fists of both youths hit their target in an instance, sand and shattered stones were sent flying away from them while the ground seemed to have trembled from the impact. Su Yi spat out a mouthful of blood while his body was sent flying 10 meters away. Yan Shangyang’s body did not fly back, but his face was already a mess of blood and flesh. His eyes bulged from their sockets as blood flowed down from his eyes. His final face still frozen in fear, shock, and regret and soon after, his body tilted back and collapsed onto the ground. The fight was witnessed by the few struggling disciples of Black Fiend School, but unfortunately, they barely stay alive, much less find the chance to interfere in the fight. Black Fiend School had two Yuan Spirit Realm cultivators. Yuan Qi materialized under their feet, forming figures of roaring beasts. They too were occupied fully by the powerful beasts and could also barely fend for themselves. Seeing Yan Shangyang’s body collapse onto the floor, the disciples of Black Fiend School were instantly filled with despair. They never imagined that there would be a kid that would suddenly appear from nowhere and actually manage to kill the Young Master. When Su Yi and Yan Shangyang were fighting each other, the giant snake, bird and the leopard with the green glow all retreated. After seeing Su Yi blown back by the impact, they paced back and forth, growling yet not daring to approach him. Su Yi got back onto his feet, blood dripping from the corner of his mouth, his shoulder shattered and bleeding as he looked at the body a few meters in front of him and walked to the body’s side. The few disciples of Black Fiend School who could barely protect themselves cried out in rage as they watched the kid climb back up to the Young Master’s side, yet they could do nothing about it. There was no doubt that the Young Master of the Black Fiend School was as dead as a doornail. Su Yi searched his body and fished out an interspatial bag. Looking at the dropped bow and arrows close by, his eyes showed reluctance, but he quickly dashed clumsily into the depth of the trees and vanished into the shadows. Behind him, the collision of powers rang out like thunder as Su Yi staggered from side to side, frantically escaping from the area, not daring to stay for a moment longer. He used his experience to find a hiding spot, of course, not even Su Yi dared to look for a spot nearby, the further he could hide, the better it was for him. Regarding the killing of Black Fiend School’s Young Master, Su Yi had never thought of letting him off today. A man who does not take his revenge is no gentleman. If he had let him go, there was no doubt he was creating trouble for himself when they meet again. And on the other hand, Su Yi was also thinking about the items on the Young Master’s body. Being the honored Young Master of Black Fiend School, he would definitely have good stuff on him and what he needed the most now was cultivation resources. Since he had met him, then it was fate. Seeing the bow and arrows from before, Su Yi could tell that they had a high value, but he resisted the temptation of taking them as well. He could not cross the line and also, he did not want to delay his escape. He was also afraid that the weapon would be too dazzling for the eyes and he did not have much use for it. If he used it in the future, it may even attract the unwanted attention of others. With his experience of previously staying in the Forest of Demons, Su Yi did not forget to erase his tracks. He had no clue how far he had run before he found a hidden cliff, surrounded by vegetation and supported by winding roots of aged trees like the coiling of dragons. A naturally formed crack within the cliff, curtained by vines and branches, this was the hiding spot that Su Yi was looking for. It was a messy battlefield. Corpses of beasts strewn across the floor and not one place was left untouched. High Elder Bai and High Elder Yu of Black Fiend School were currently looking at the corpse of Yan Shangyang on the floor. His face incomplete, leaving behind only a bloody mess. Their faces were pale white and twisted as they could be. High Elder Bai was furious. Compared to the incident at the mine, he was more unwilling for the Young Master to run into harm’s way. His cold and furious voice echoed through the forest as the air in the surroundings turned freezing cold. The remaining elite disciples of Black Fiend School, though each one of them was in a pathetic state and injured, no one dared to give a second opinion and each of their faces was glum. In an eyeblink, figures of bodies dashed out and into the deep forest. It was night time. The surroundings were silent and not a single sound to be heard. Above the massive stretches of mountains, stars in the vast sky started to sparkle and beside the seam in the cliff, occasionally a few shrubs would show their faces. Within the deep depths of the crack, there was a faint movement of light. Hidden by the depth of the crack and the vegetation surrounding the cliff, no traces of the light were shown to the outside world. Within the mysterious space, the energy of heaven and earth was rich and abundant. Su Yi was sitting cross-legged, a hand seal formed as he performed the “Supreme Chaotic Yuan Technique”. He was currently recovering from his serious injuries. After three days spent recovering, Su Yi’s originally deathly white face had regained some color and the aura surrounding his body was no longer weak. At a point in time, he let out a breath of stale air. The light radiating from his body retreated back inside him. Su Yi’s tightly closed eyes gradually opened as a light shone brightly from them, then turning quickly into a deep black filled with resilience. Feeling the changes within him, Su Yi was quite shocked. In the battle with Yan Shangyang, he had wasted himself completely and was also seriously injured, but now the Yuan Qi within his Yuan Qi whirlpool was even more abundant than before.